The pancreas plays an essential role in our bodies, so an inflamed pancreas is not something that can or should be ignored. The official term for an inflamed pancreas is pancreatitis, and it can be an acute, sudden disease or a chronic condition. Either way, the inflamed pancreas will have to be diagnosed and treated. The main function of the pancreas has to do with digestion. Enzymes from the pancreas help to break down nutrients in the small intestine. The pancreas becomes inflamed and problematic when something blocks the pancreatic enzymes from getting into the small intestine to do their job. When these enzymes cannot pass into the small intestine, they instead work on the tissue in the surrounding area. This can lead to acute or chronic pancreatitis. In most cases, acute pancreatitis is caused by one of two things: either damage brought about by alcoholism or as a side effect of gallstones. Alcoholism can have a negative impact on physical health in general, but it is particularly damaging to the pancreas. It is quite common for alcoholics to develop inflammation in the pancreas. If gallstones are the cause, it is because the stones are blocking the pathway for the pancreatic enzymes to leave the pancreas and enter into the small intestine. As would be expected, the most common symptom of an inflamed pancreas is sharp pains in the abdominal area. Much like the feelings that come with gallstones or kidney stones, pancreatitis pain tends to travel into the lower back. Some pancreatitis sufferers also experience fever, nausea or vomiting. Pancreatitis treatment usually depends on the cause, but some acute cases can be treated with over-the-counter pain killers. If the inflammation is caused by an infection, the doctor may also prescribe an antibiotic. It is also wise to stay away from all forms of alcohol and overeating while treating pancreatitis, since this illness affects digestion. Alcoholism is almost always the reason for chronic pancreatitis, although it takes years of alcohol abuse for the disease to fully develop. Pancreatic inflammation that is caused by alcoholism usually begins with a series of repeated bouts with the illness. Eventually, however, the pancreas will become permanently damaged. There are a few other causes of chronic pancreatitis, including cystic fibrosis, drug use (illegal and prescription), genetics, increase in blood triglyceride levels and radiation therapy. Chronic pancreatitis has the same painful symptoms as the acute version, except that they happen more often since the illness is recurring. In some chronic cases, the pain can be aggravated or brought on by eating or drinking, especially alcohol. Chronic inflammation of the pancreas must be treated to avoid permanent damage to the pancreas, which will result in serious digestive problems. 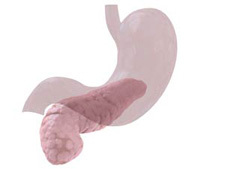 Chronic pancreatitis can also lead to diabetes and, in extreme cases, pancreatic cancer. The best way to treat this chronic illness is with dietary changes, the most important being total abstinence from all forms of alcohol. This is a tall order if alcohol is the cause of the disease, but it is necessary to enable healing. Dietary treatment will generally call for a diet that is lower in fat and has more carbohydrates. A high-carb, low fat diet helps the pancreas function better by requiring less of the pancreatic enzymes for digestion. In some cases, pancreatitis patients will be given enzyme supplements to assist with digestion, but this is usually only when the pancreas is severely damaged. Other severe cases may require that part of the pancreas be surgically removed.